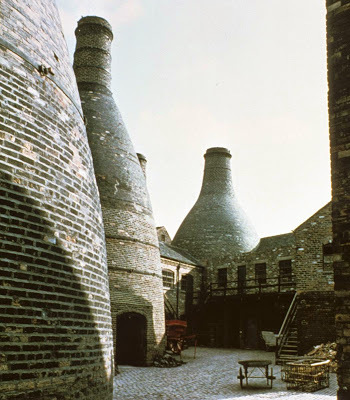 The Potteries Bottle Oven: What is a Bottle Oven? A bottle oven or kiln is a brick-built, bottle-shaped structure in which pottery, or its component materials were fired. The simplest type consists of two main parts. The outer part, which is bottle-shaped, is known as the hovel. This could be up to 70 feet (21m) high. All hovels had one distinctive and common feature, a bottle shape. This shape, with its wide base and narrow neck, evolved to accommodate the firing chamber (the oven) together with room for men, materials and equipment. The tapering chimney was better for creating draught which aided the firing process and helped to take away smoke. It also improved protection from bad weather. The inner part is the firing chamber. It is a cylindrical structure with a domed roof, which is called the crown. Its walls are about 12" (30cm) thick. Iron bands, known as bonts, run right round the circular oven about 12" (30cm) apart to strengthen it as it expands and contracts during firing. A doorway, the wicket, just large enough for a man with a saggar on his head to pass through, is built into the oven. The wicket is surrounded by a stout iron frame. Around the base of the firing chamber are firemouths (the exact number depends on the size of the oven) in which fires were lit for the firing. Inside the oven there is a small chimney, called a bag, over each firemouth. The bags carried hot gases and intense heat from the fire into the oven's interior. Flues underneath the sloping floor of the oven, leading from each firemouth, distributed the heat throughout the inside. In the centre of the oven floor is the well hole. Each bottle oven had its own 'character' and the fireman had to learn how best to work with them, to control and cajole the way they performed and fired. All were intermittent since the firing process occurred periodically, at regular (and sometimes irregular) intervals. The oven was filled with pottery, fired to temperatures as high as 1450°C for some pottery recipes, and then cooled and drawn. The process would then start all over again. Busy factories aimed to fire their ovens regularly and on the same days every week. Neighbouring households would know that they should not hang out their washing to dry on firing days if they were to avoid smoke smuts. Pottery usually needs firing several times during its manufacture. Different ovens were needed for each type of firing. Depending on its output, a factory could have 25 ovens or more. Within a factory, ovens were not situated to any set plan. They may have been grouped around a cobbled yard, similar to the layout at Gladstone, or in a row. Sometimes they were built into the workshops with the upper part of the bottle-shaped chimney protruding through the roof. The chimney of this type of oven was usually built directly onto the shoulder of the firing chamber. The name 'bottle oven' was derived from their particular shape and not as a reference to the manufacture of bottles! Some ovens were used for firing pottery to the biscuit and then the glost stages. These huge ovens could hold as many as 3000 dozen (36,000) pieces of pottery at a time. Some, much smaller, were used for firing applied decoration to the ware to render it permanent. Smaller still were hardening on muffle kilns. Some ovens were described by the way they operated - either as updraught or downdraught or muffle. Some were used for calcining flint or bone for use as components of the pottery body recipe. Some were described as 'oven-n-ovel' (oven and hovel, or more simply hovel oven) where the oven stands in the centre of the separate circular hovel which was, essentially, the chimney stack. These could be entirely free-standing or partially attached to an adjacent workshops, for instance, the placing or saggar shop. Others were described as stack ovens where the oven and the bottle-shaped stack were built together. In this case, the bottle-shaped chimney stack was built straight onto the top of the shoulder of the oven. This type became part of the entire structure of the factory, with the stack rising through its roof. Some ovens were a combination of both hovel oven and stack oven. In 1939 there were about 2000 bottle ovens in The Potteries of Stoke-on-Trent (not 4000, which has been ignorantly suggested, elsewhere). In 2019, fewer than 50 bottle-shaped structures remain standing. Some have been restored to excellent condition yet others are just short of a heap of rubble. All are Listed Buildings. Gladstone Pottery has five of those still in existence, and there are two next door at the Roslyn Works. 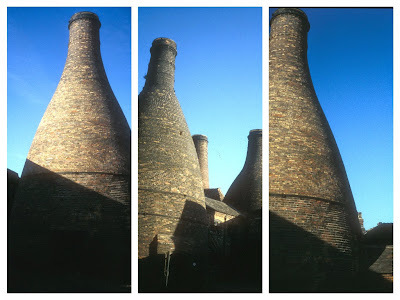 So in a this very small area of Longton, the southern-most town of Stoke-on-Trent, there are seven magnificent bottle ovens - 15% of all those remaining in The Potteries. A very special place. The Gladstone Pottery was restored and opened to the public as a museum officially on 24 April 1975 by The Duke of Gloucester. In the years since the museum opened its huge and magnificent ovens have undergone restoration and all five at Gladstone can be explored. The people of the Potteries who lived and worked in these buildings invariably despise them. They created ill-health, terrible lung disease and early death. They filled the atmosphere of the area with thick black smoke and "golf ball-sized" smuts. They ruined brickwork and paintwork and etched windows with the acid rain which they created. They blackened churches and municipal buildings. The hovel bottle oven: A bottle-shaped structure, built from brick, in which pottery was fired. It most commonly consisted of two main parts, an outer hovel and an inner oven. The outer, which is the bottle shaped part, is known as the hovel. This could be up to 70 feet high, but never less than 60 feet according to the Borough of Hanley Works Committee Minutes – 14 February 1877. The hovel acted as a chimney taking away the smoke, creating an up-draught and protecting the oven inside from the weather and uneven draughts. There is a narrow gap between the hovel and its inner part which was called the firing chamber. The firing chamber is a round, robust brick built structure with a domed roof, called the crown, and its walls are approximately 1 foot thick. Iron bands, known as bonts, run right round the circular oven at intervals, to strengthen it as it expands and contracts during firing. The entrance to the firing chamber is called the wicket. A entrance to the firing chamber, called the wicket, was just large enough for a man with a saggar on his head to pass through, preferably without crouching. It is built into the structure of the firing chamber and surrounded by a stout iron frame. Around the base are firemouths - the exact number depends on the size of the oven - in which fires were lit for the firing. Inside the firing chamber, over each firemouth, is a bag (a small chimney) which carries most of the intense heat from the firemouth into the setting inside. Inside the oven. Bags, flues and blackened and charred walls. Look up to the crown and crown damper, and out to the wicket. Flues underneath the floor leading from each firemouth distribute the heat throughout the inside. In the centre of the floor is the well hole. Pottery may need to be fired up to 10 times during its manufacture and different ovens were needed for each type of firing. Depending on the output of each factory, a single works could have anything from one to 25 ovens, and up to 40 on very big factories (Spode, in Stoke, had 37 in 1843). Gladstone Pottery has five. At the Middleport Pottery of Burgess and Leigh, near Burslem, just one remains but at its height the factory had seven. Within a factory, ovens were not situated to any set plan. They may have been grouped around a cobbled yard (as a Gladstone Pottery) or in a row, or rows. Sometimes they were built into the workshops with the upper part of the hovel protruding through the roof. The stack (chimney) of such ovens was usually built on the shoulder of the oven itself.